Delegates at the Democratic National Convention officially nominated Hillary Clinton as the party’s presidential candidate in Philadelphia, Pennsylvania. Thousands of protesters rallied outside, disgruntled with the party agenda. Protests against the DNC continued into the late night hours, but the mood progressively turned to calm. Instead of standing and chanting, many sat and sang. One witness reported an "excessive amount of sage." 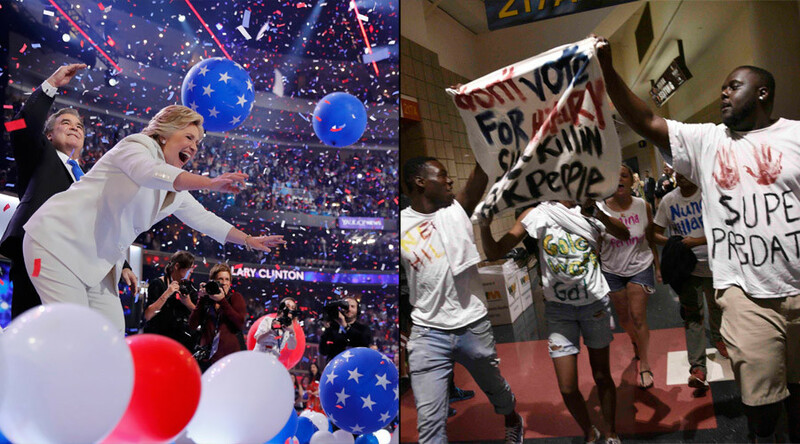 This marks the first time the iconic post convention balloons have been released for a female candidate. "I'm not here to take away your gun... I just don't want you to be shot by someone who shouldn't have a gun in the first place." Hillary: I'm not here to take away your guns.